Know Your Dances: Dance Styles Explained – with Music & Video Samples of Each Dance – Our unique and original article listing and explaining for you the different styles of dancing and the dances included in each style, along with actual samples of the type of music corresponding to each dance, and links to videos of top rated Pros performing each dance, so you can see what the dance looks like when done well. 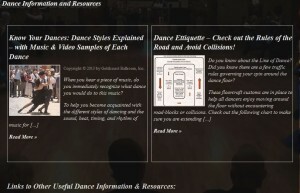 Check out this unique and very helpful original resource provided by Goldcoast Ballroom. Other articles and information that we will post periodically, providing useful tips on how to improve your dancing, tips on finding a dance partner, tips on competing in dance competitions, where and how to find the dancewear you want, and other helpful dance information and resources. Links to the major dance organizations and other helpful resources for dancers and those interested in ballroom dancing. If you have helpful information or resources to share, please Contact Us.